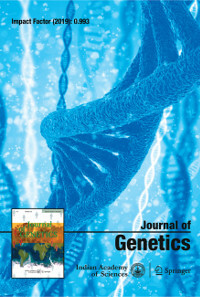 quantitative trait gene; inheritance; markers; molecular breeding; maturity genes. Allelic combinations of major photoperiodic (E1, E3, E4) and maturity (E2) genes have extended the adaptation of quantitative photoperiod sensitive soybean crop from its origin (China ∼35◦N latitude) to both north (up to ∼50◦N) and south (up to 40◦S) latitudes, but their allelic status and role in India (6–35◦N) are unknown. Loss of function and hypoactive alleles of these genes are known to confer photoinsensitivity to long days and early maturity. Early maturity has helped to adapt soybean to short growing season of India. We had earlier found that all the Indian cultivars are sensitive to incandescent long day (ILD) and could identify six insensitive accessions through screening 2071 accessions under ILD. Available models for ILD insensitivity suggested that identified insensitive genotypes should be either e3/e4 or e1 (e1-nl or e1-fs) with either e3 or e4. We foundthat one of the insensitive accessions (EC 390977) was of e3/e4 genotype and hybridized it with four ILD sensitive cultivars JS 335, JS 95-60, JS 93-05, NRC 37 and an accession EC 538828. Inheritance studies and marker-based cosegregation analyses confirmed the segregation of E3 and E4 genes and identified JS 93-05 and NRC 37 as E3E3E4E4 and EC 538828 ase3e3E4E4. Further, genotyping through sequencing, derived cleaved amplified polymorphic sequences (dCAPS) and cleaved amplified polymorphic sequences (CAPS) markers identified JS 95-60 with hypoactive e1-as and JS 335 with loss of function e3-fs alleles. Presence of photoperiodic recessive alleles in these two most popular Indian cultivars suggested for their role in conferring early flowering and maturity. This observation could be confirmed in F2 population derived from the cross JS 95-60 × EC 390977, where individuals with e1-as e1-as and e4e4 genotypes could flower 7 and 2.4 days earlier, respectively. Possibility of identification of new alleles or mechanism for ILD insensitivity and use of photoinsensitivity in Indian conditions have been discussed.